In the late 1870s, this gifted writer of hilarious, bad verse had a national following. Mark Twain even wrote that he always carried with him a copy of Julia’s first book of poems, The Sentimental Song Book (1876). "I find in them the same grace and melody that attracted me when they were first published twenty years ago, and have held me in happy bonds ever since," he explained. Twain attributed the "deep charm" of Julia’s poems to her innocent habit of making "an intentionally humorous episode pathetic and an intentionally pathetic one funny." Twain immortalized Julia’s style in the writings of Emmeline Grangerford, a character in The Adventures of Huckleberry Finn. If these songs [as Julia called her poems] were only a little closer to the conventional modes of meter, rhyme, thought, and expression they would not impress us at all. Touched, however, by the magic wand of genius, the novel works of this great poet cause readers to slump down in their chairs, hold their agitated and aching sides, wipe tears from brimming eyes, and fill the air with the sound of distinctly raucous laughter. 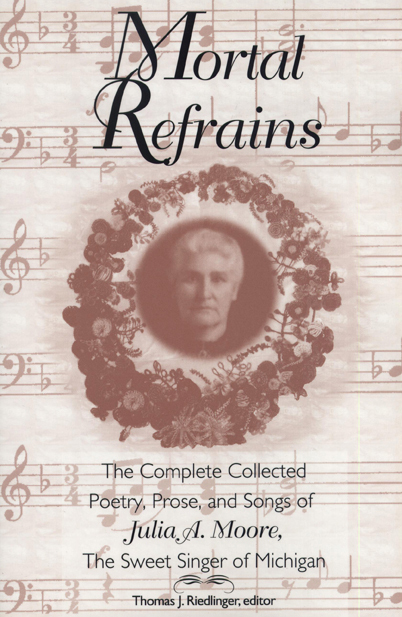 Mortal Refrains is the first complete, published collection of Julia Moore’s work—poetry, short stories, songs (including sheet music), and newspaper interviews—compiled from the earliest published versions found in various public libraries, rare book collections, museums, and archives. Thomas J. Riedlinger is a writer and lecturer based in Olympia, Washington.